Desktop Feltidermy and how they came about! Lions and tigers and feltidermy, Oh my! I know I’ve been a bit absent from the blog again the past couple of weeks, but now you can see one reason why. Alright, yes, I’ve also been enjoying the spring we’ve been having…but also creating! For about the last week the new desktop feltidermy pieces have had most of my attention. The desktop felidermy came about from a custom request. 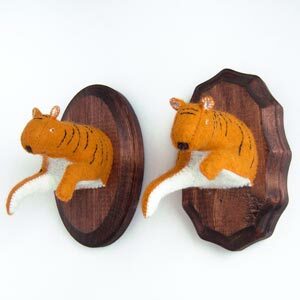 The request was for 2 tigers (pictured above) looking like they are leaping out of the plaque. Well, of course I loved this idea, but I had to figure out how to make it work. I spent a couple days just researching images of tigers leaping, jumping, diving and well anything but standing still. After I finally had that stuck in my head I started building my pattern, once I had it ready all I had to do was get to cutting and stitching. 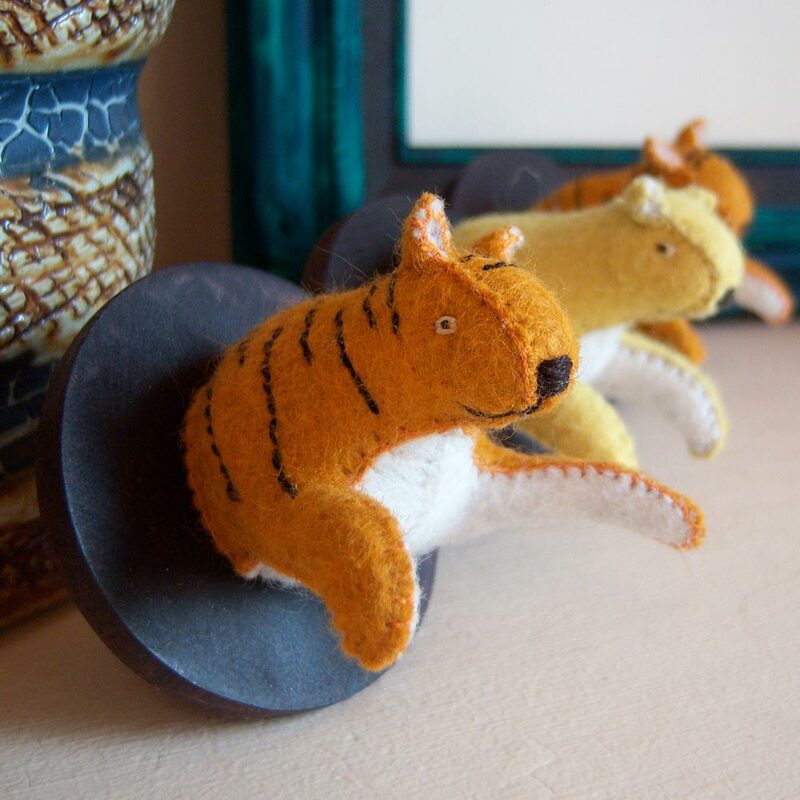 I started stitching the first tiger and the shape was exactly what I wanted, they were just a bit small for the size I needed. 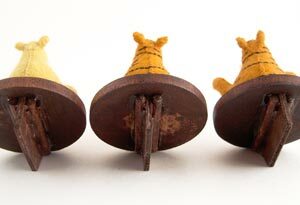 Now I just had to figure out how to make them stand on their own. Notice how I said “just” haha… I thought about how to make them stand as I was stitching, browsing the hardware store, walking the dog, cooking dinner, watching the new season opener of Doctor Who, I think even while sleeping. I finally did figure it out and I was still able to attach the plush to the wood as usual, the stand just cover my hardware for attaching. Believe me, these guys and their stands are not separating! So yeah, that’s what I’ve been up to…Now to hope that everyone else loves them as much as I do! You can find them in my Etsy shop. I hope you are all having a great week! Thanks for stopping by!